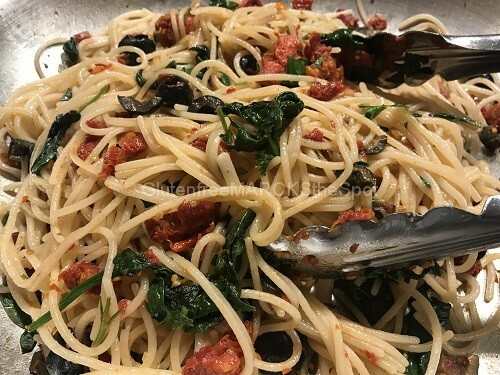 Our version of gluten-free Pasta Puttanesca was a huge success! Everyone wanted more that by the time daddy got home, there was barely enough to give him a serving. The kids all voted that I needed to make MORE next time! Putting a healthy meal on the table doesn’t have to be hard or time consuming. You can have a quick and easy dinner that tastes like you spent hours in the kitchen, with just a little planning. All fresh – all delicious! Overall, this dish took about 15 minutes to pull together – a perfect dish to prepare for a busy family night. This is a great throw together dish which allows you to add more or less of the ingredients. 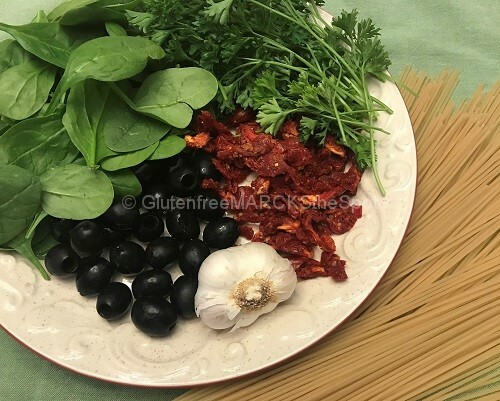 Learn the trick to cooking gluten-free pasta. Otherwise, you can end up with a gummy, all stuck together mound of mush! Add the pasta to boiling water and stir occasionally. Timing is key. For brown rice pasta like Trader Joe’s or Tinkyada Brown Rice Spaghetti or pasta, 8 minutes works well. It’s important to stir the pasta often while cooking as the noodles tend to stick together. 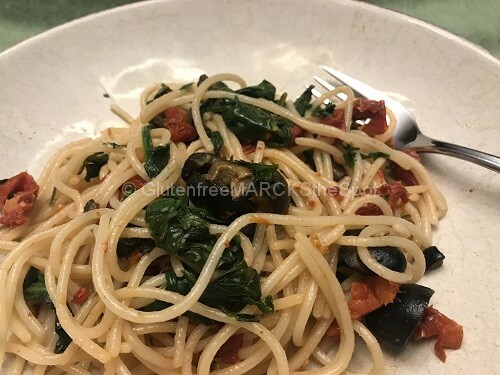 Gluten-Free pasta can turn to mush quickly if overcooked, making it very unappealing. Test the pasta for softness before draining to see if more time is needed. 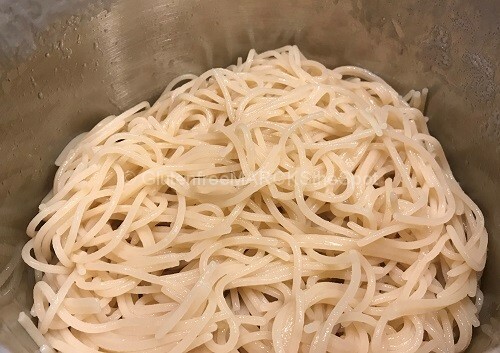 As the pasta is cooked, it can look gummy and soupy. Draining and rinsing the pasta well under cool water takes care of this. 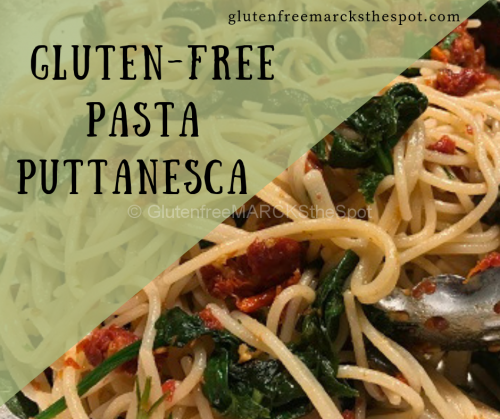 Once you get the hang of cooking gluten-free pasta, your friends and family won’t even know you are serving them gluten-free pasta! All you need is 15-20 minutes! 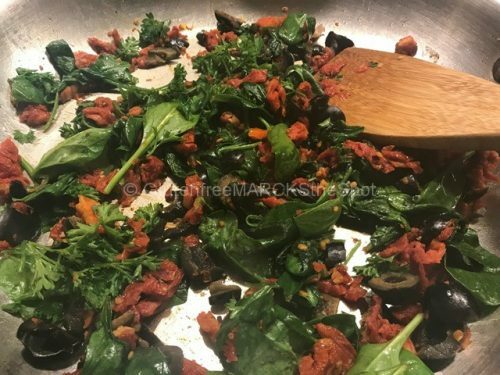 To prepare this dinner simply add the garlic cloves, chopped olives, reconstituted and chopped sun-dried tomatoes, along with the rinsed spinach and chopped parsley to a large skillet with 1 T olive oil, over medium-low heat. Stir often to avoid burning. 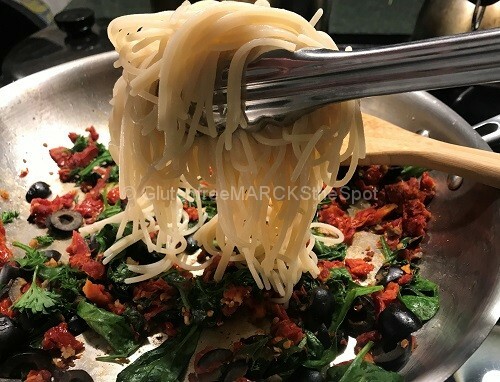 Once the spaghetti is cooked and rinsed, add it to the skillet of sautéed veggies. Drizzle 1-2 T of olive oil over the top, stirring well to combine the veggies with the pasta. To serve, place pasta in a bowl and sprinkle with pink Himalayan salt. Chopped avocado, fresh tomatoes, or additional fresh chopped parsley are all great toppers. You can build up this dish by adding a clean protein like shredded chicken or fish. This is an easy and delicious dinner to have on the table in less than 20 minutes! Add more or less of the ingredients to make it your own. Boil a large pot of water for your spaghetti. Stir the pasta often while cooking,about 8 minutes. When the pasta is cooked, rinse well under cool water. When you start to boil the water for the pasta, put on a small sauce pan of water to boil, covered. Once boiled, add the sun-dried tomatoes and boil for 3-5 minutes. Drain, rinse and put aside. In a large skillet, add 1 T olive oil. Crush the garlic cloves and add to the pan. Using a garlic press is ideal for this step. Chop the olives, add to the pan. Turn the heat onto medium-low. Chop the sun-dried tomatoes and add to the skillet. Stir often to avoid burning. Rinse the spinach and add to the tomato mixture, continuing to stir often. Chop the parsley and add to the pan. Keep in all moving in the pan. Drizzle 1-2 T of olive oil over the top. Stir well to combine the veggies with the pasta. Chopped avocado, fresh tomatoes, or fresh, chopped parsley are all great toppers. Easily add sauteed chicken or fish to boost up this dish. 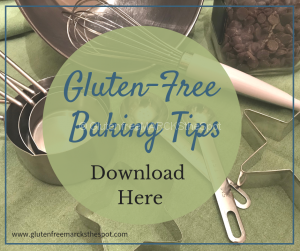 Don’t miss out on any new recipes or excellent information for your gluten-free life! 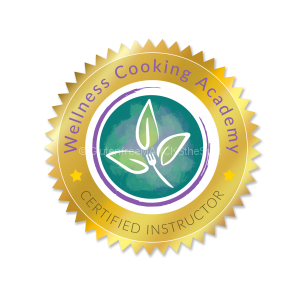 Sign Up Today and Receive 5 FREE Easy & Delicious recipes! This information is being provided to you for educational and informational purposes only. 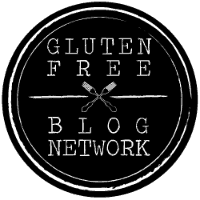 It is being provided to educate you about gluten-free living and as a self-help tool for your own use. It is not meant to diagnose, treat, prevent or cure. This information is to be used at your own risk based on your own judgment. Always seek the advice of your own Medical Provider regarding any questions or concerns you have about your specific health, or any medications. The information shared is not allowed to be reproduced, replicated or sold. This entry was posted in Gluten Free Living, Recipes. Bookmark the permalink.